You are selling For Sale By Owner and a Buyer wants to buy your home. Now What? You have a Realtor that just presents you with an offer. Now What? The Assistance Option program helps individuals who have opted to buy or sell a home with or without the service of a Realtor. This program provides paperwork to closing assistance and assistance in reviewing offers that come in from a Realtor. We then help with the countering/negotiations/etc. The cost is a one-time small fee. We will review all offers that you receive until you are ratified (under contract). We assist you in coming up with a counter you can send to the buyer's agent. Agents like to take advantage of sellers that are FSBO. They know you are emotionally attached to your home and they know you are not familiar with all the terminology. You DO NOT need to fill out the assistance option paperwork if an agent is involved. 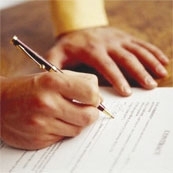 We will assist in the preparation of the paperwork based on the terms seller and purchaser agree. We will then go over the paperwork with seller and buyer. Once there is a ratified contract, we will then do all of the below. Assist you in all areas of the home selling process. Unlimited *Business Hour Support throughout the process for contract questions. Coordinate completion of appropriate paperwork. (As agreed upon by you and the buyer). Assist in meeting the requirements of the Purchase Agreement, as to inspections, reports, etc. Assist with suggestions for the counter offer to the Buyers' agent. We will assist in the negotions with the Buyer's agent. Assist in expediting the loan process in order to obtain loan, or loan assumption, approval (if same be required as set forth in the Purchase Agreement). Assist in meeting the requirements of the closing agent in connection with the closing of Seller and Buyer. Review Closing Statement/ALTA (formerly called HUD) before closing (if requested). Guide you through the steps to bring your sale to closing. Draw up the offer is buyer is without an agent based on the terms seller and purchaser have agreed. We will then work with BOTH Seller and Buyer to meet the terms of the contract to get all parties to closing. We also offer extremely reduced settlement fees through our referral network of settlement companies. We charge a flat fee for this service instead of the 3% most agents charge to do the same service!! We are fully licensed Realtors. *After Hour Support is available for a nominal fee. We take the fear and complexities out of selling your home. If your Buyer does not have a Realtor. If you have ALREADY PAID: CLICK HERE to get started with the paperwork.